An elegantly furnished 4,254 sq. ft 5 bedrooms 5 bathrooms, luxurious pool home with a third-floor game room overlooking the wonderful Arnold Palmer designed Legacy golf course at Reunion, Orlando's premier golf Resort. The open planned living area has a stylish leather sectional sofa with ottoman, large 60-inch LED TV with Blu-Ray player and large wet bar area with fridge. The adjoining kitchen features stainless steel appliances and granite counter tops. The luxury dining area will seat 8. From the French Doors of the dining area, there is access to the outside Patio which has a further two additional tables each seating 10, the perfect space for getting together with friends or family to enjoy lunch or an evening meal while taking in the beautiful scenery of the golf course. The villa itself is arranged over three floors with a separate annex. It will comfortably sleep 12 people due to its 4 king bedrooms and 1 twin room which are all furnished to the highest standard with each having either golf course or pool views. In addition to the King bedroom in the in-laws apartment, there is also a queen sofa bed and SMART TV in the living area should there be a need for additional sleeping. All bedrooms have LED TV's, and en-suite bathrooms. The Master bedroom has access to a large balcony with stunning views of the Legacy golf course. 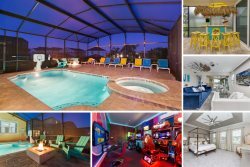 The large entertainment and theater room on the top floor features a wet bar with fridge, pool table, dart boards, Xbox 360, PlayStation 4, and a pub style table with 4 chairs for a friendly game of cards. There is also an 80-inch SMART TV, Blu-ray player, upgraded cable with sports channel, and with two rows of seating for the ultimate movie and gaming experience. There is a row of 3 reclining cinema seats as well as a futon style couch that also converts to a single bed. Access to another large balcony provides another space where you can sit and enjoy the truly stunning views. It is very easy speaking with a team member. They are professional and always accommodating. Our favorite features were the balcony's which were relaxing and had nice views.